When members of your group add their results on RiderHQ, they automatically appear on the left-hand side, and also in the 'results feed' (which you can subscribe to in any feed reader, for example Google Reader or NetNewsWire). 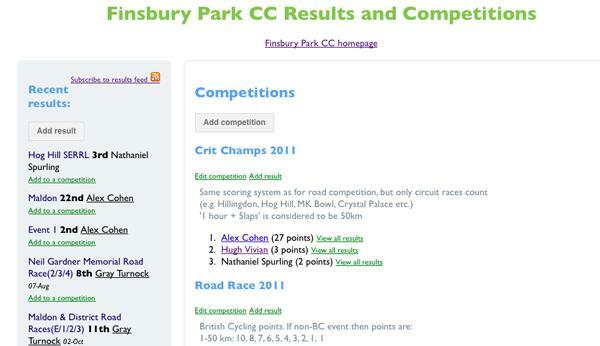 You add 'competitions' on the right: log in as an administrator of the group and click the 'Add competition' button that appears there. Once created you can click on any result, click 'add to competition' and enter how many points that result is worth. A result can count towards more than one competition, and it's up to you how you calculate the points (you can use the 'competition description' to explain the scoring, as is done in the picture above). You can choose whether results must be entered by group admins, or allow members to assign their own results to competitions - in the latter case you can review what they put in and edit if necessary, and it saves you having to do all the work! Once you have a competition or two that you want to track, you can get things moving by adding any results you know about. In the meantime, you can add any results for them as if they were already signed up, by clicking the results link, (shown above) next to their name in the members list - these will show up on the competitions page immediately, and when they claim their membership the results you added will be transferred to their RiderHQ account.